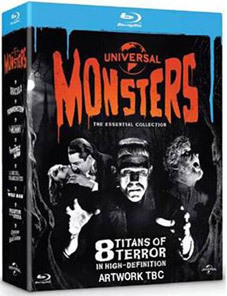 Some of us here are big fans of old school Universal horror, and so are a little excited by the prospect of seeing eight of the studio's most iconic genre masterpieces being released together, for the first time ever, on Blu-ray as Universal Classic Monsters: The Essential Collection. All have been digitally restored in high definition for a set that includes a never-before-seen featurette about the restoration of Dracula and the first ever offering of Creature from the Black Lagoon in its restored Blu-ray 3D version. So what films are included? Universal horror fans, start licking your lips. The original 1931 movie version of Bram Stoker's classic tale has for generations defined the iconic look and terrifying persona of the famed vampire. Dracula owes its continued appeal in large part due to Bela Lugosi's indelible portrayal of the immortal Count Dracula and the sometimes captivating direction of horror auteur Tod Browning. Boris Karloff stars as the screen's most tragic and iconic monster in what remains one of the greatest horror films ever made. Dr. Henry Frankenstein (Colin Clive) dares to tamper with the essential nature of life and death by creating a monster (Karloff) out of lifeless human body parts. Director James Whale's adaptation of the Mary Shelley novel and Karloff's compassionate portrayal of a creature groping for identity make Frankenstein a timeless masterpiece. Horror icon Boris Karloff stars in the original 1932 version of The Mummy in which a team of British archaeologists accidentally revives a mummified high priest after 3,700 years. Alive again, he sets out on an obsessive-and deadly-quest to find his lost love. Over 50 years after its first release, this brooding dream-like horror classic remains a cinematic masterpiece. 100 Years Of Universal: The Carl Laemmle Era. 100 Years of Universal: Unforgettable Characters. Feature Commentary with Scott MacQueen. Feature Commentary with Film Historian Tom Weaver. 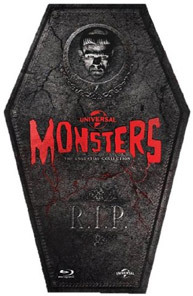 Universal Classic Monsters: The Essential Collection will be released on UK Blu-ray on 1st October 2012 by – surprise, surprise – Universal Pictures UK at the RRP of £59.98, although you can find this heavily discounted at some on-line stores. The collection will also be available in a limited edition coffin box. We've been unable to confirm the RRp of this one, but expect to pay between £8 to £10 more than the regular box set.